Using the links below, conduct a brief research project based on one of the men listed. Answer the suggested questions on a sheet of lined paper and add it to your notes on the life of soldiers and diplomats in the 1840s Southwest. This information will be very helpful when writing your narrative piece on Thursday in class. Where was he originally from? What other significant actions did he take? 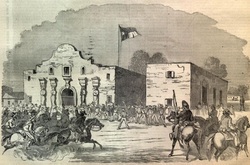 What was his role in the founding of the Republic of Texas or the entering of Texas as a state?